Clint Bowyer has a lot at stake two with just races before the Chase. Racing for a spot in the Chase is one thing, it’s an entirely different thing to be racing for a job. With the absolution of MWR’s full-time team beginning in 2016, Clint Bowyer has more on the line than anyone else. Clint’s numbers on the Road to Richmond aren’t pretty. In nine starts at Darlington, Bowyer’s found himself inside the Top 10 just once, and only at Atlanta (21.3) does he have a worse average finish than his 20.1 showing at the Lady in Black. Richmond has been a little kinder to ol’ Shifty. With two wins and the second-most Top 10 showings at any track, his odds of celebrating in RIR’s Victory Lane are certainly better than his odds in the Southern 500. 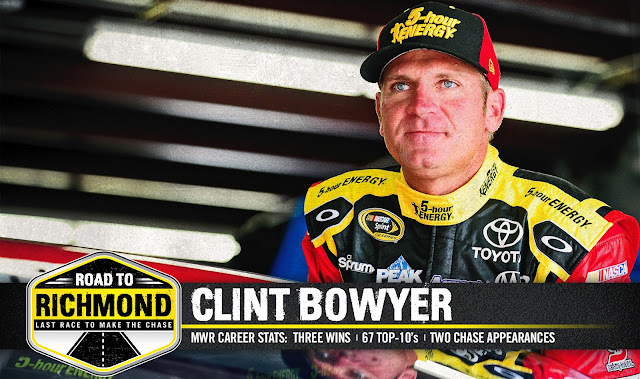 With only two weeks left until the 2015 Chase field is set, Richmond may be one of Clint’s last chances to impress next year’s boss. Pile on missing last year’s Chase by just six points, and you’ve got an even more determined (desperate?) driver hunting down that W.
Kurt Busch: Master of Land, Air and Sea?